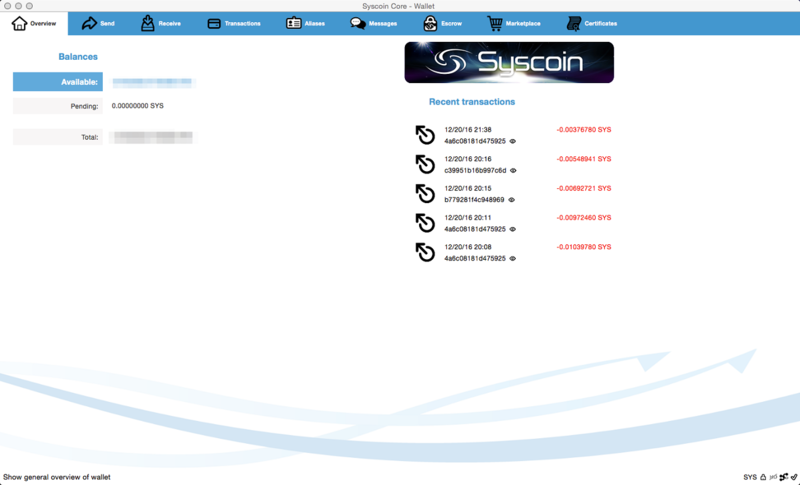 Most Recent News: Syscoin 2.1 Released and New Payment Processor! 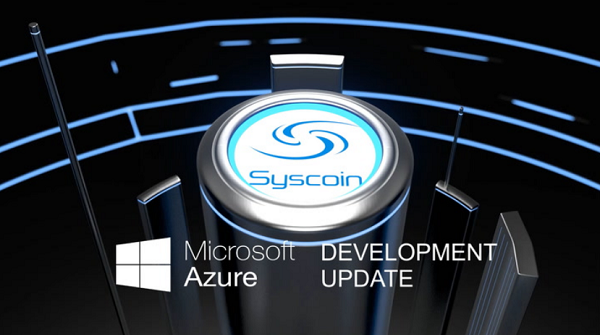 Syscoin 2.0 is a cryptocurrency based the Syscoin 1.0 originally launched August 14, 2014. This thread is a continuation of this thread, which was the Syscoin 1.0 launch thread. Syscoin is unique fintech asset that offers much more than simple currency transfer. Syscoin provide an entire marketplace ecosystem built around the SYS token but cross-compatible with Bitcoin (BTC) as well. Unlike many coins the features below are not on the roadmap they are live and in production launched April 30th, 2016 as version 2.0. Value from the 1.0 chain as of block 880510 was migrated to the 2.0. * Blockchain Pruning – Provides improved scalability to the core syscoin blockchain by efficiently pruning expired service data to minimize blockchain bloat for full nodes. * Unique Aliases / Syscoin Identities – Syscoin Aliases are now unique across the network; a change from Syscoin 2.0 where variable-case aliases were permitted. * Alias Portability – Optional passwords attached to aliases provide for portability and restoration options not possible on Syscoin 2.0 including the ability to recover an account simply by using the related Alias password. * Marketplace Moderation – Two tiers of marketplace moderation both user-defined via SafeSearch and team-defined via a 3 tier system. The moderation system allows for a more public-friendly marketplace with options for SafeSearch restricted items. * Private payments via ZCash – Syscoin users can now leverage ZEC as a direct payment option, which natively includes enhanced privacy. * Multiple payment options – Offers can now be paid for in any currency supported by the marketplace and supported by the merchants. Rather than one specific currency, payments can be now be made using all three supported blockchains (SYS, BTC and ZEC). * Multi-signature Transaction Support across all Syscoin services – Aliases, Certificates and Offers, now support multi-signature transactions, enabling a whole new class of use cases for Syscoin services. 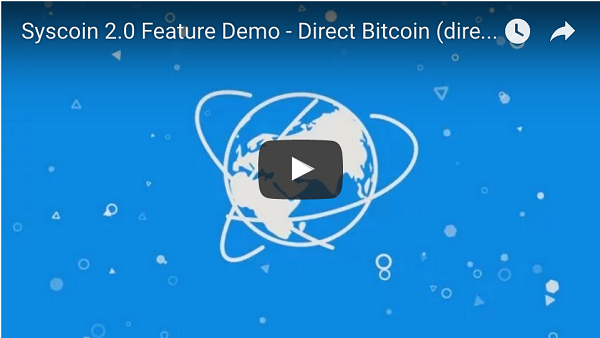 * Bitcoin 0.13 Core Update – As outlined in the launch of Syscoin 2.0, the importance of keeping up-to-date with the latest bitcoin technology is essential for Syscoin to thrive; thus, we planned on keeping up to date with the latest Bitcoin core. Keeping up-to-date will be accomplished by upgrading the Syscoin 2.1 update to Bitcoin’s latest core 0.13.99. * Escrow Support on External Payments – Escrow was previously only available on offers purchased using Syscoin. With Syscoin 2.1, Escrow will now be available on offers purchased with any currency accepted, SYS, BTC or ZEC. * Private Alias Data – Aliases now include a private field which is visible only to the owner of the alias, allowing for private data storage on the blockchain. * Default Settings – There is now support for default Alias and default price-peg selection, increasing wallet usability. All service screens now also include the option to view all services the wallet owns or view services by individual Alias. * Dynamic Fees – Fee information is now stored in the Alias rates peg allowing for dynamic fees specifically for Syscoin services. This enables different fee structures with different pegs and gives merchants more flexibility in pricing. 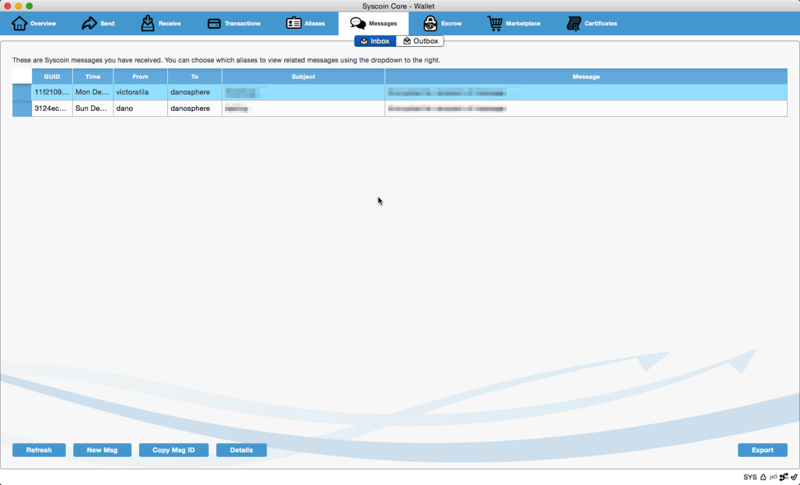 * Shipping Notification System – Optionally allows merchants to notify customers that an item has been shipped. * Feedback and Rating System – A 5-star feedback and rating system can now be provided for Merchants, Customers and Arbitrators, ensuring an accurate representation of reputation history for all parties. * Easy unlock for encrypted wallets – Easy unlock mechanism for improved usability w/encrypted wallets. * Hide Sold Out/Expired Offers – Hide items that have are sold out or expired from wallet listing screens. * Search within category – Search within a specific category rather than always searching all categories. 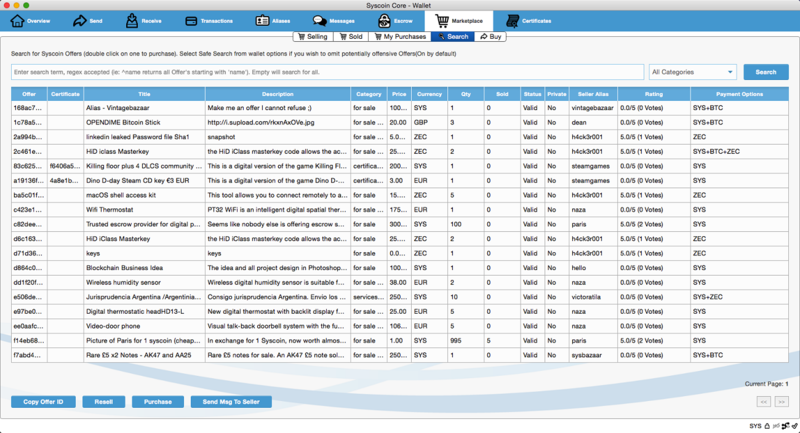 * Suggested categories – A standardized set of categories across the Syscoin marketplace, or use your own. * Offer geolocation – Optionally add geolocation to offers. * Inflation reduction - Mining schedule advanced from 6% inflation to 1.5% inflation. We have much more development planned throughout 2016 and beyond as well. Please check out our ROADMAP which we're constantly updating. Download Syscoin 2.1.1 on Github Now! * December 20th, 2016 - Syscoin 2.1 Released and New Payment Processor! * April 30th 2016 - Syscoin 2.0 is Live! 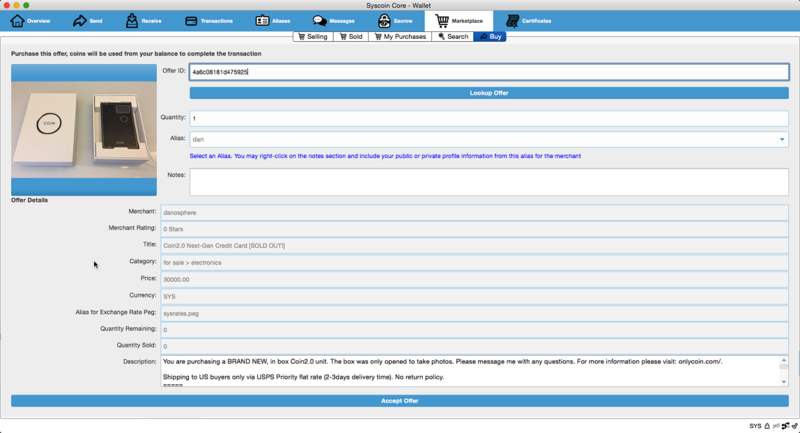 * February 29th 2016 - Syscoin 2.0 Final Public Beta Now Available! Win up to 1.5 MILLION Syscoin in prizes! Contest begins in Syscoin slack #general channel 12/29 @ 20:00 UTC! As part of an incentive program to get people to read and understand the underlying technology of the Syscoin 2.1 core we introduce a question-and-answer style contest where we will give away up to 1.5 million Syscoin to those who answer first. The questions will be based on information given in the Syscoin Whitepaper and will be held in the Syscoin slack #general channel. Questions may be timed so if no answer is given within the time limit the next question will be asked. Timing can vary between 1 and 4 hours and winners are selected based on whoever answers first. Only one winner per question. Winnings will range from 10k SYS (around $90 USD) all the way up to 250k SYS (around $2250 USD) per question. 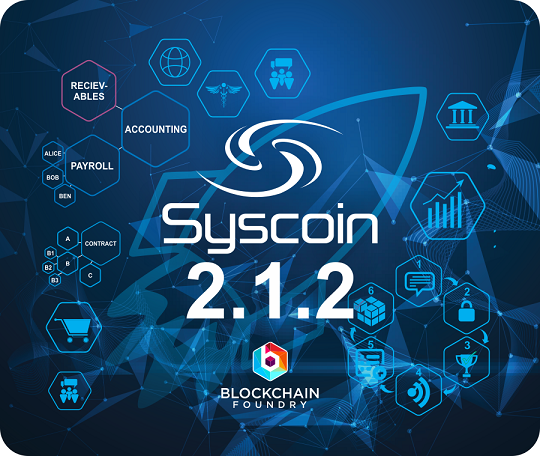 Learn more about the innovative blockchain features introduced in Syscoin 2.1! 1.5 million SYS up for grabs! 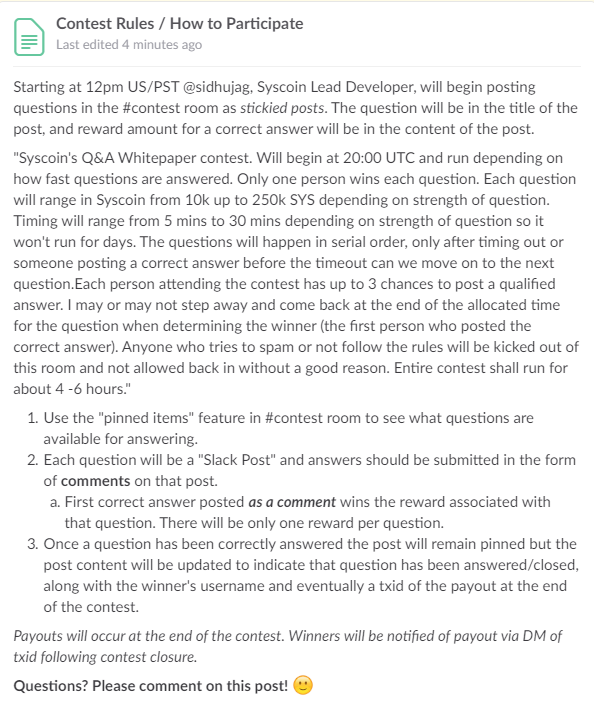 Join syscoin slack and ask to be added to #contest now! Whitepaper knowledge contest was a great success, lots of fun and learned a thing or three too. Congrats to all the winners! Multisignature Aliases in 2.1.2 allow sharing messages or payments with a group. MS Alias Trees coming in 2.1.3 can share with branches. 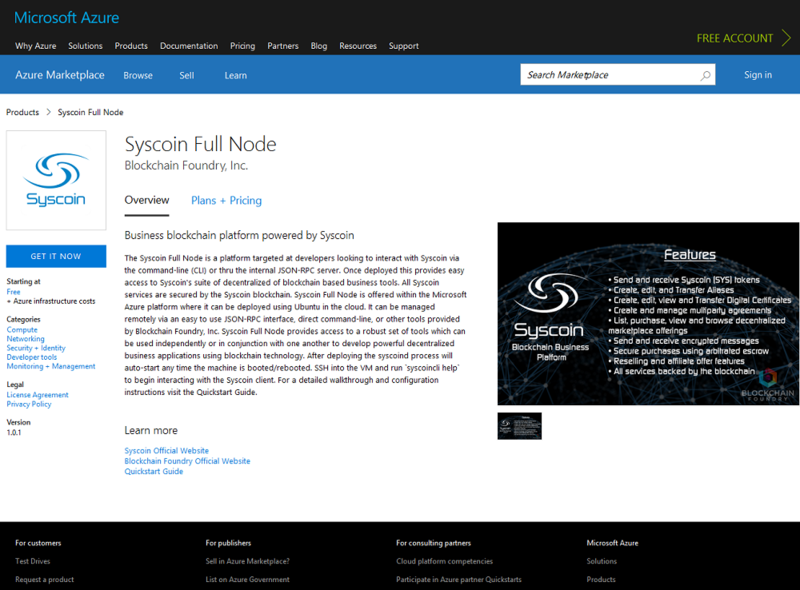 Syscoin's First Certified Microsoft Azure Blockchain Product Now Available! We’re nearing the end of Q1 and our team has been extremely busy mapping out the future of Blockchain Foundry Inc. and Syscoin. We have some major milestones on the roadmap for Q1 2017 and now that we have more accurate projections, as well as insights into Q2 and some of Q3 2017 we wanted to update the community on the future of Syscoin, Blockchain Foundry, brand strategy, products & partnerships as we continue to push for Syscoin’s increased adoption and value. After publishing the Syscoin 2.1 Whitepaper Blockchain Foundry received a lot of interest in both general blockchain consulting as well as efforts tied directly to Syscoin’s expanded use cases. Progress in both of these areas has the potential to which could greatly increase Syscoin’s value. We strive to be as agile as possible and because these opportunities could lead to funding, increased value for Syscoin and more rapid development of future products we’ve prioritized seizing the opportunity to work with these organizations, while still ensuring “Blockmarket Desktop” be ready with minimal delays and “Blockmarket Web” alpha be ready in time for Consensus where we’ll be meeting with some of these partners and some large investors. Blockmarket Desktop Public Beta will be released in late April followed by the mid-May release of Blockmarket Desktop pending unforeseen circumstances. Much of our roadmap over the coming months is geared around the Consensus conference. With a modest team like ours, prioritizing resources is critical and we’ve been able to seize the opportunities that have presented themselves. Fostering these relationships and planning these integrations takes time, as does the research and development needed to service the needs these organizations have expressed to us. That being the case, we’ve had to think carefully about how to mature these early-stage partnerships while also delivering on our product pipeline for 2017. One of our main goals is to increase Syscoin’s value and strengthen Blockchain Foundry’s value pre-investment; these partnerships will help us reach these goals. After evaluating our options, we’ve decided to slightly rearrange our roadmap. Previously, our first version of “Blockmarket” was targeted for the end of Q1. As we have some additional major news targeted for the end of Q1, our experience tells us that it does not make sense to include a release at the same time as a large marketing push coordinated with one of our major partners as this up-coming announcement is not related to “Blockmarket” and would potentially steal the thunder that “Blockmarket” will create for the fintech industry. “Blockmarket Desktop” and “Blockmarket Web” alpha will now be targeted for presentation at the “Consensus 2017” conference we will attend in New York, while releasing major updates along the way & building up to this important event. 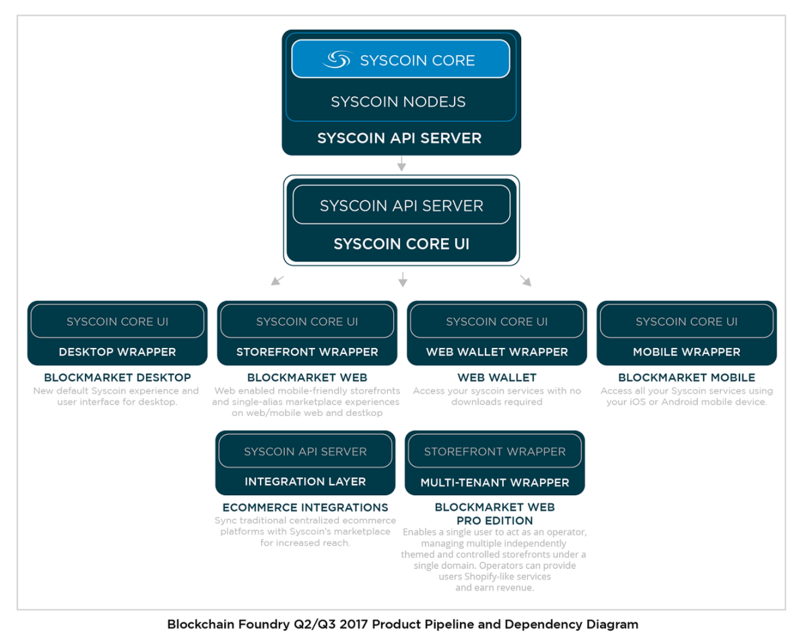 As shown in the diagram below, “Blockmarket Desktop” relies on two major products/components being developed by Blockchain Foundry, in addition to Syscoin itself. Due to our ongoing initiatives, we’re going to release Syscoin 2.1.3 in the next few weeks as well as “Blockmarket Desktop”, while work on the next major Syscoin core release has already begun. Early in Q2 of 2017, following the release of Syscoin 2.1.3, we will release an entirely new desktop application dubbed “Blockmarket Desktop”; AKA “Blockmarket for Windows” & “Blockmarket for MacOS”. This application is a complete rewrite of the wallet user-interface experience and makes it a more modern and user friendly application – like Coinbase but on the desktop, rather than the wallet experience of today. As the graphic above illustrates, the fundamental components for Blockmarket Desktop are stepping stones to our following product; “Blockmarket Web”. Paving the way to ease-of-use and adoptability, the “Blockmarket Desktop” release alone will greatly improve marketplace-adoption thanks to its more eBay/Etsy like browsing and purchasing experience. 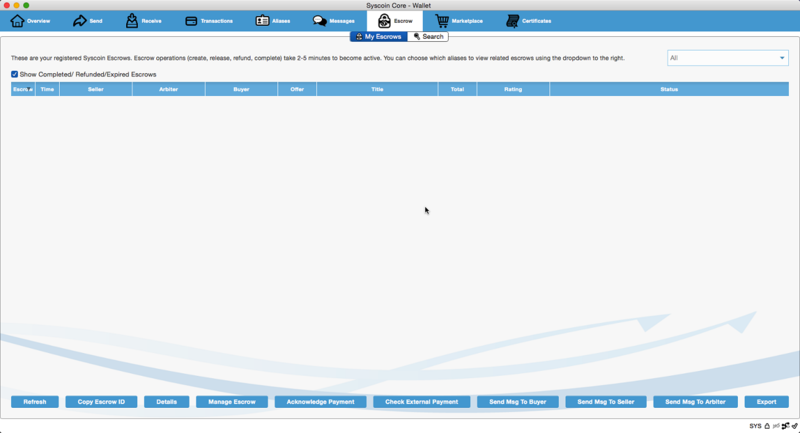 The building blocks of “Blockmarket Desktop”/Syscoin Core UI and the Syscoin API enable us to then rapidly deliver “Blockmarket Web” alpha in time for Consensus 2017 so we can demo it there along with “Blockmarket Desktop”, other Blockchain Foundry products, partner initiatives, Syscoin services, a multitude of use-cases, etc. We wanted to make sure that our community was informed before updating our official roadmap. 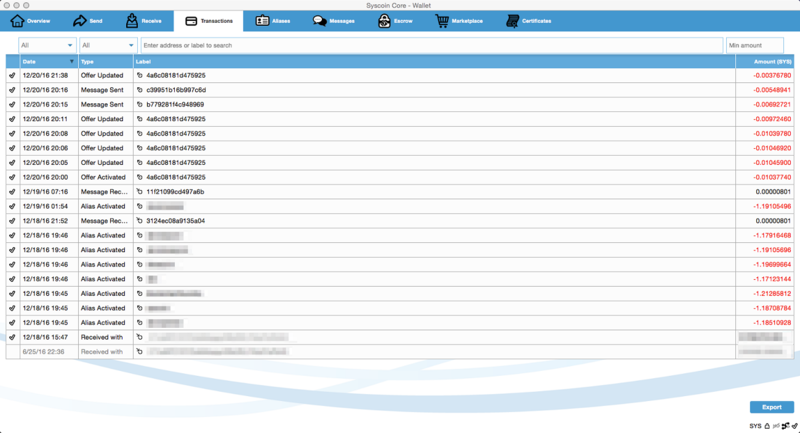 Work on “Blockmarket Desktop” is well under way aswell as preparing for the Syscoin 2.1.3 core update. Below are just a few of the screens we’re developing for “Blockmarket Desktop”. The UI should all be considered work-in-progress, but development is coming together well. We’ll share more preview screenshots and videos of “Blockmarket Desktop” development as we prepare it for beta release. We are constantly working to improve Syscoin’s implementation, security, reliability, and long-term scalability. As we’ve been having discussions with several Fortune 500 companies about using Syscoin; reliability and scalability really becomes a major concern as it relates to blockchain data storage in general. The current core has many innovations already present to help mitigate scalability issues, however, this does not satisfy the big-data scale that certain companies require. We’ve had to reassess how data is managed within Syscoin. One specific company inquired about systems that needed to handle “one billion transactions per minute”; these needs require huge amounts of data throughput that cannot be supported by any existing blockchain project. Through research and development, we’ve been able to solve a lot of the problems related to these “enterprise-level” data requirements and we’re working to incorporate this into our next major core-release after the “Blockmarket Web” release. We will issue an innovation update closer to the Consensus 2017 event. Establishing our corporate entity Blockchain Foundry has opened a multitude of doors for us. The newly established entity has enabled our team to engage with large enterprises with the goal of increasing Syscoin’s real-world use. A few entities have helped us guide our technological direction to better serve specific use-cases that they require in order to transform their traditional business processes into more streamlined and cost-efficient blockchain-based solutions. These ongoing discussions have led to opportunities that could greatly increase the value of Syscoin. As we continue to mature the Blockchain Foundry company identity and now have a better vision of our long-term brand strategy, we’ll be releasing a new Syscoin website in Q2 of 2017 that is a single page & purely informational. This page will share branding and themes with a new Blockchain Foundry website, also to be released in Q2 of 2017 at the same time as the new Syscoin website. The new Blockchain Foundry site will feature a section dedicated to Syscoin and its ecosystem of applications. Quick links to the Azure products offered by Blockchain Foundry powered by Syscoin and easy access to developer API documentation, etc. This is all part of our long-term strategy to turn Blockchain Foundry into a corporate umbrella that services a variety of blockchain-based offerings and products. From open source projects like Syscoin, to proprietary products like the new “Blockmarket Desktop” & “Blockmarket Web” applications and the various other products currently in our pipeline. Once the new websites are launched, all blog posts (such as the one you are reading) will come from the Blockchain Foundry blog; this blog will be archived for users and investors to access at their convenience. Blockchain Foundry is positioned to “push” Syscoin adoption through its pipeline of products and developer tools, some of which have already been released. It also enables us to attract traditional investment, helping accelerate our work; securing seed funding is one of our next and most essential to reach goals. As mentioned, we are already making inroads with Fortune 500 companies, discussing how they can use Syscoin. We’re listening to feedback from the enterprise and consumer markets and using that data to guide our product direction over the next year. Our goal is to provide value to both the consumer and enterprise markets and create a platform that enables an ecosystem of applications in the process. Our developing network of partners is currently targeted at getting these entities to use the Syscoin platform for real-world applications, to improve and streamline their business operations and increase Syscoin’s value in the process. Syscoin’s full potential has yet to be fully realized; the best is yet to come. We have also been active in recruiting additional engineering talent as we scale up to demands of the market. We have had ongoing discussions with a few notable individuals known to the community as well-respected Senior Software Developers and we continue to aggressively act to bring in additional talent to help grow as a company and provide value not only to Syscoin investors but to the users who will depend on its services. Syscoin and Blockchain Foundry’s mission is much larger than just “marketplaces”. Using Aliases as the cornerstone for a new kind of decentralized identity solution that can service a variety of functions for companies in simple yet effective ways that other major blockchain projects struggle to do. These innovations will be part of what we deliver in 2017 following our initial pipeline of products and partnerships. Syscoin and Blockchain Foundry Inc. are on-track for a very successful 2017 and have an exciting lineup of products being released in next few months leading up to Consensus.